Luxurious Shutters on the Beach! Los Angeles waterfront or beach hotels with Spa! What better way to relax than to have a relaxing massage at a beachfront hotel in Los Angeles? To be pampered from head to toe? To walk along miles of fun Los Angeles beaches? A Hotel stay in a Los Angeles waterfront hotel that includes a spa is a real vacation! We can all agree that, to be a distance away from our favorite beach and having to travel to it (through LA traffic) would take away from a precious beach vacation in LA. 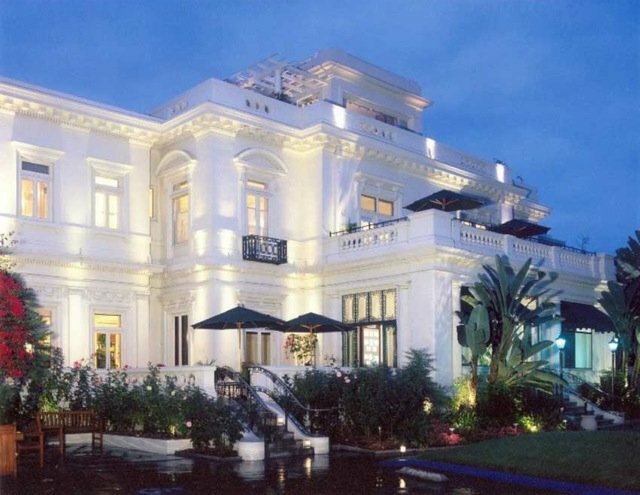 Los Angeles waterfront hotels with spa vary from the more modest to more luxurious accommodations. Much of this depends on location. We recommend you visit our Best Los Angeles Beaches page and choose the best beach and location for your beach vacation. Choosing the best from Los Angeles waterfront hotels with spa to suit your taste will then be a snap. We have also included Beachfront Vacation Rentals in Los Angeles for those wanting to share a home with friends and family. This can be of significant cost saving when sharing accommodations as well as meals. Beaches in Malibu include Zuma and Point Dume and Paradise Cove. To the West you will find El Matador and Leo Carrillo. To the East you will find Malibu Lagoon State Beach. 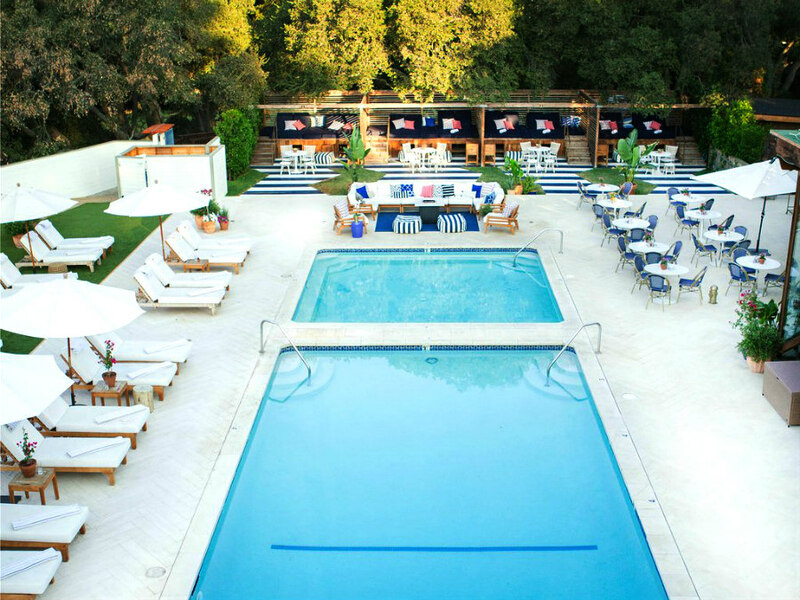 This top rated Los Angeles beach hotel located in Malibu is not on the waterfront but is part of a very large 250 acre property. Why do we then refer to it as waterfront? Simply because guests have exclusive use of their 5.5 acre Calamigos Beach Club just 12 minutes away via luxury shuttle. At this beautiful beach estate, guests will be able to have full use of complimentary surf boards, paddle boards, beach chairs and more. Here you will also be able to enjoy full dining facilities with incredible ocean views as well as a beach bar. Malibu luxury at its best! This Malibu waterfront hotel with spa is a winner of the coveted 2018 Conde Nast Traveler Gold list as well as TripAdvisor Certificate of Excellence. So... enough said about excellence in facility as well as service. At the Spa you will be able to enjoy Hot Stone Massage, Swedish Massage, Deep Tissue Massage, Reflexology Massage and of course a Couples Massage. Their skin care expert has over 35 years experience in helping people look their very best. You will also be able to enjoy a guided beach yoga class on their private beach area complimentary to their guests. The Malibu Beach Inn is located on what is nicknamed Billionaire's Beach. Enjoy a relaxing dinner while enjoying a beautiful ocean sunset. 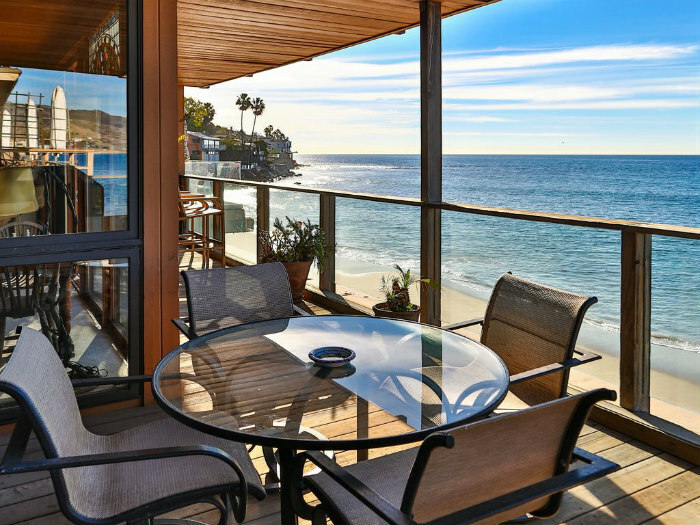 Malibu waterfront vacation rentals courtesy of HomeAway. Good value Malibu waterfront vacation rentals up to 1500.00 per night. Great for multiple families or just a great bunch of friends! Have a look at these Luxury Malibu Waterfront Vacation Rentals from $1501.00 to much much more! For those who love the extras in life. The beautiful Santa Monica State Beach is the most family friendly beach in Los Angeles. With its amusement park atmosphere and a beautiful sandy beach, the kids will love it here. So if this is a family vacation, you may want to consider this beach. 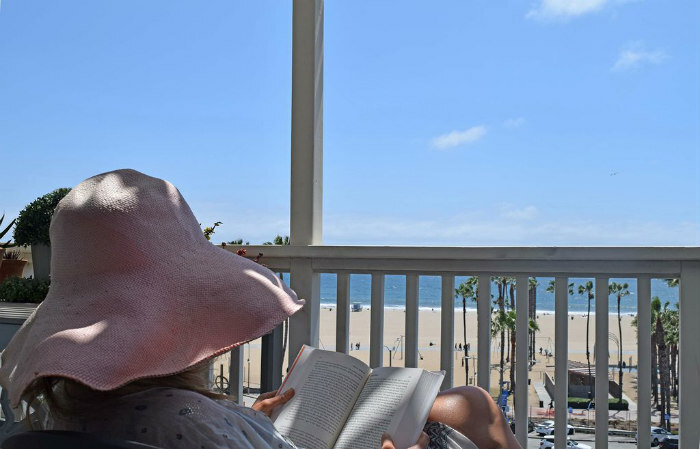 This luxurious Los Angeles waterfront hotel offers a beautiful location directly on Santa Monica Beach and only a few minutes walk to Santa Monica Pier as well as Main Street if you wish to do some serious shopping. Built in 1927 and extremely well maintained and updated, it offers architecture and style of days gone by with all the comforts of our day. The Sea Wellness Spa is focused on making your stay at the Case del Mar just part of a luxurious stay. Here is their menu of treatments you may choose from. With breathtaking views of the Pacific Ocean and located on Santa Monica Beach, this hotel's architecture is reminiscent of inviting Cape Cod vacation homes. The waves of the ocean and the beach directly at the resorts doorstep, beckon you to an early morning stroll. Peace of mind finally becomes a reality. ONE Spa also offers the royal treatment when it comes to a total spa experience. It is considered one of the premier spas in Los Angeles. Here is the menu of treatments available at ONE Spa located within Shutters on the Beach! Enjoy this very luxurious waterfront hotel in Los Angeles! Across the street from the Santa Monica Beach, Loews Santa Monica Beach Hotel offers one of the very best pools with ocean views and a pool concierge. 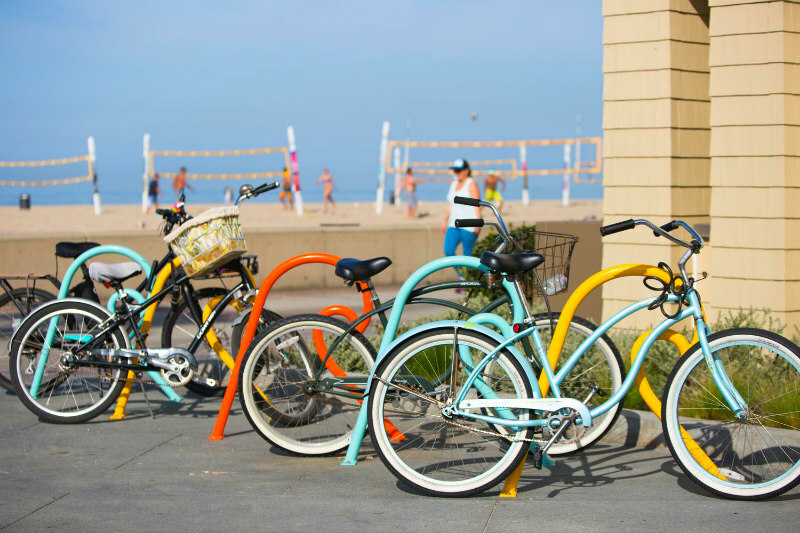 Their on site rental shop offers boogie boards, bicycles and more to make your Los Angeles beach vacation as much fun as it can be. Looking to relax? View Loews Ocean Spa Menu to prepare for a memorable spa experience. 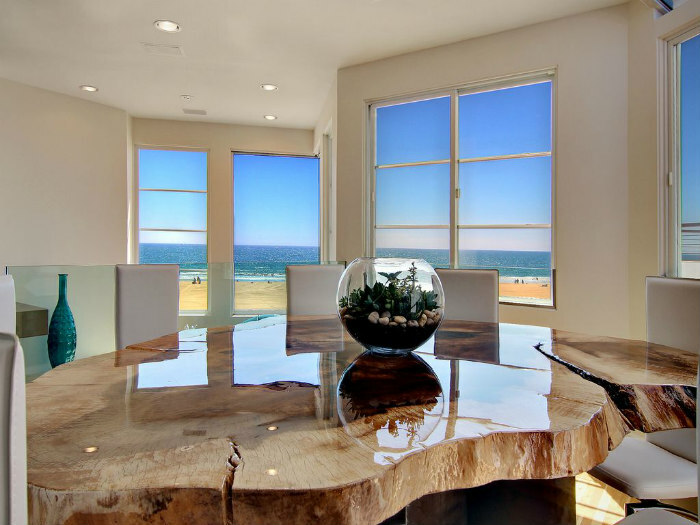 Here are some of the most popular waterfront or beachfront vacation rentals in Santa Monica. We always suggest thorough research to ensure the property you are viewing is truly "beachfront" or "waterfront". Many may be separated by roads. Good planning makes for the best vacations! Have a look at these value priced Santa Monica waterfront vacation rentals up to 1500.00 per night. These are some of the more luxurious Santa Monica Waterfront Vacation Rentals from 1501.00 or more. Venice Beach is great for people watching with buskers or street entertainers to keep you entertained close to the beach. You will also find all kinds of shops selling all kinds of items. Call it a day at the circus! Very limited choices for Los Angeles waterfront hotels at this Venice Beach. Spa hotel at Venice Beach? Not likely... 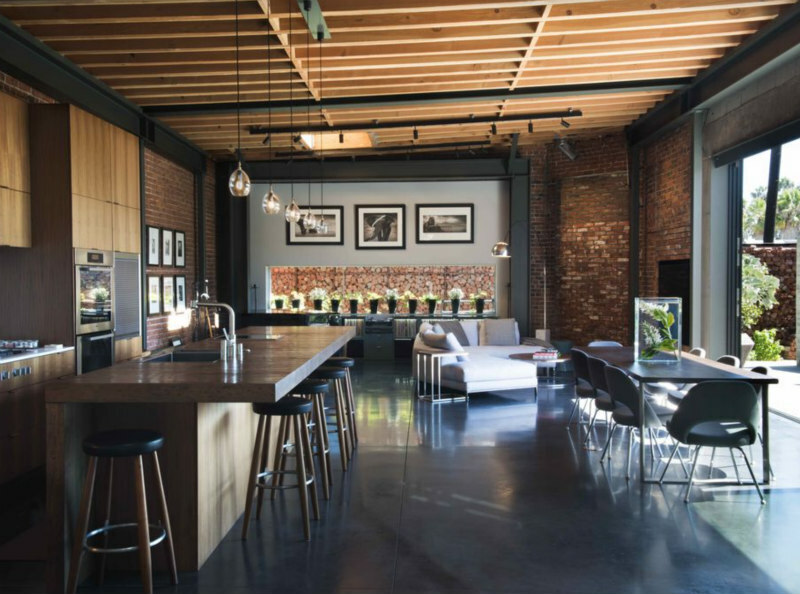 It's all about the eclectic vibe here. This hotel is the closest hotel to this beach. Separated from the beach only by a public walking path. 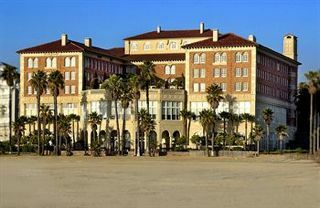 It is considered one of two waterfront hotels in Venice, Los Angeles. It has a nice rooftop patio which is great for watching all the Venice Beach activity. It is a well maintained older boutique hotel and suits the area's eclectic crowd beautifully. Breakfast is included with your stay and the rooftop deck is great for sunsets. No Spa. 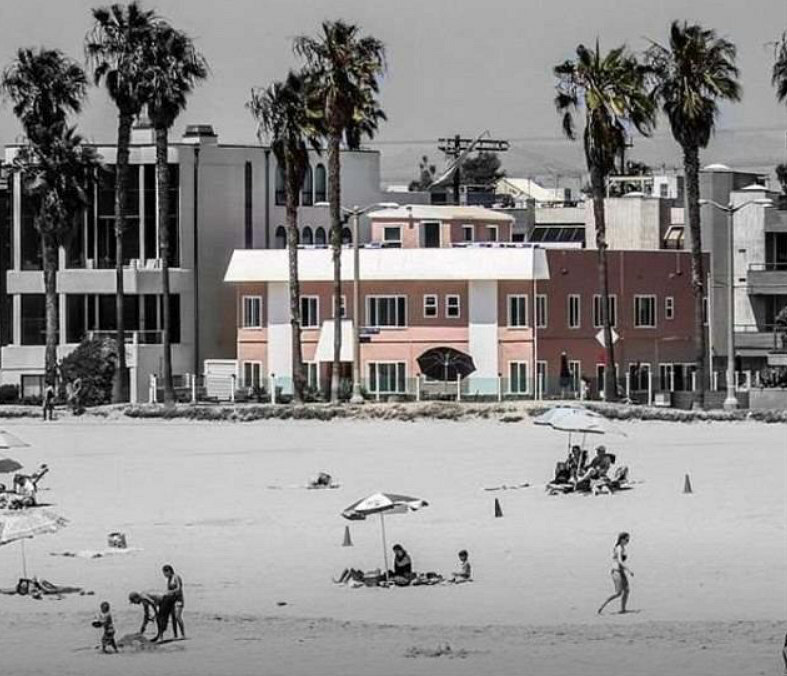 This Venice Beach hotel is just 200 feet away from the beach. Rated as a 4 Star you can expect comfort, good service and amenities. People love the only rooftop bar in Venice to go along with the great sunsets. At Hotel Erwin, they love the eclectic atmosphere that Venice Beach projects so you can expect a blend of relaxed feel yet dedicated to customer service. No Spa. 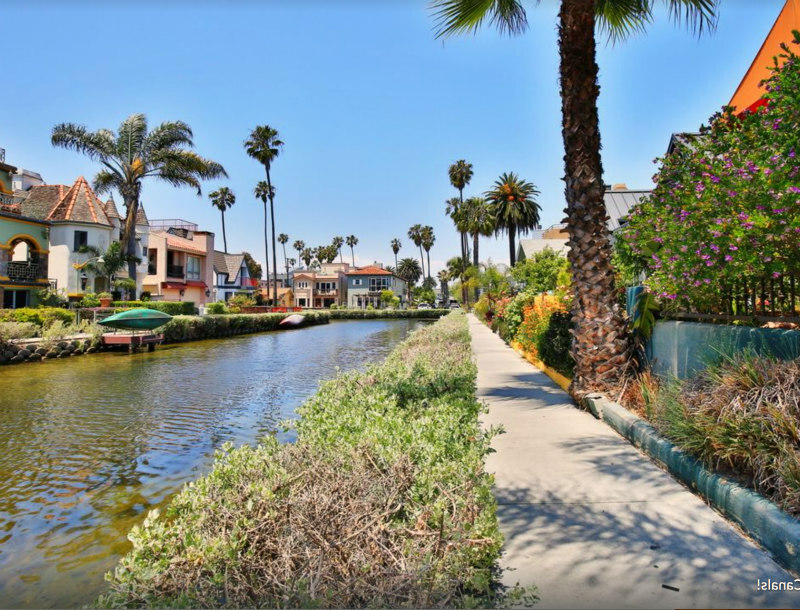 Venice Beach waterfront vacation rentals courtesy of HomeAway. Value waterfront vacation rentals under $1000.00 per night for you to enjoy Venice Beach in Los Angeles. Luxury Venice Beach waterfront vacation rentals over $1001.00 per night. Great for small groups or multiple families with kids. Manhattan and Hermosa Beach both offer luxurious beach vacation homes. "Considered the Beverly Hills On The Beach" and birth place of Volleyball you will want to find out more about Manhattan Beach and Hermosa Beach. You'll enjoy this waterfront boutique hotel on Hermosa Beach, Los Angeles. Perfect for romantic couples, they include a continental breakfast from their cafe with beach and Pacific Ocean views. For 20 miles (32KM) "The Strand", just outside your door will take you all the way to Venice Beach on your bike available at this hotel. Perfect for an all day affair. Start in early morning, get lunch at Venice Beach and be entertained and then head back for a perfect, romantic sunset. 11 Miles (17Km) South of Hermosa Beach is the luxurious Terranea Resort. Sitting on a plateau overlooking the Pacific Ocean, this 102 acre resort features the 50,000 sq. ft. Terranea Spa and Wellness Centre. The resort also features a small 9 hole par 3 golf course just to keep you entertained. 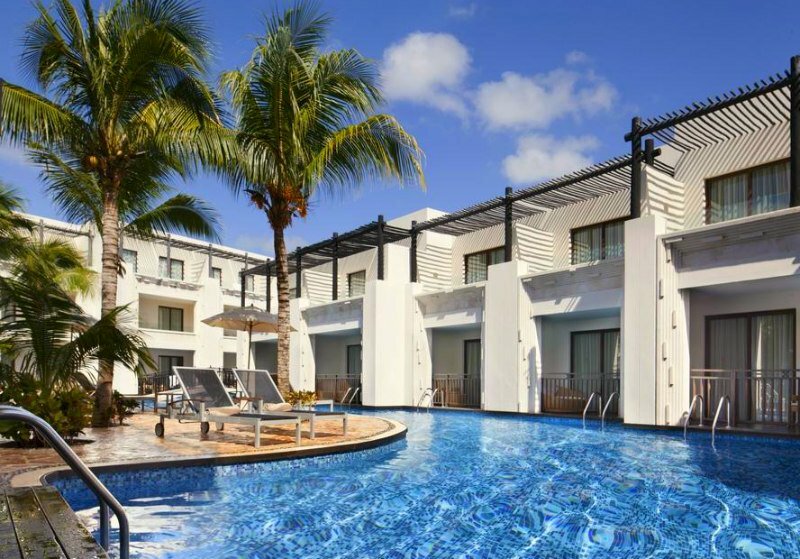 The four oceanfront pools are sure to be a hit with the kids as well. This luxurious Los Angeles waterfront hotel with spa is sure to please the whole family. Looking for great Manhattan Beach and Hermosa Beach waterfront vacation rentals? Here they are , courtesy of VRBO.com. 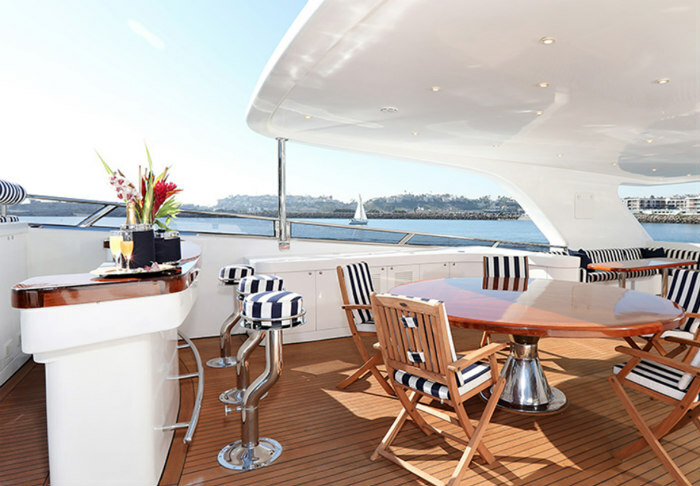 Either of these marina hotels in Los Angeles will do the trick for yacht lovers and charters are easily arranged. Enjoy a day out on a chartered sailboat or yacht. • If you are looking for true beachfront accommodations, please ensure there is direct access to the beach. Crossing a street may be considered waterfront. Beachfront should have direct access to beach. • Most hotels will have the bike path between them and the beach. This is fully acceptable. • A Los Angeles beachfront vacation rental is a great way to share expenses. Kids love the freedom that a beachfront vacation home provides. • Keep in mind the location of the Los Angeles Airport. Here are the best Los Angeles beaches to plan your L.A. beach vacation. Thank you very much for your contribution of photos to our page.